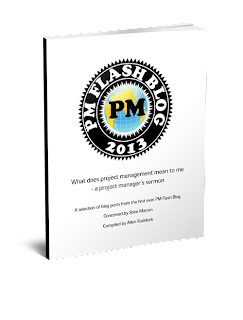 Musings on project management: Scale down, or "too small to succeed?" Most of the posts I read are about scaling up to ever larger projects, but what about scaling down? What if you are doing bug fixes and small scale projects with just one or two people? Is a methodology of any help, and if you're working with software, can Agile be helpful scaled down? To the first point, my answer is: Sure! A methodology -- which is just a repeated way of stringing practices together -- can help. Why invent the 'string' (methodology) each time you do something? Just follow the same practices in the same sequences each time. Thus, you can have a methodology for just driving your car... perhaps the ultimate team-of-one. Re agile and small scale: Really, the agile manifesto does not inherently break down at small scale; nor do the agile principles. It's actually easier to go smaller than to go larger. Teams and all the stuff about team work if you are only one or two people? Collaboration and communication by osmosis with others? The hardest thing to deal with in a too-small team is lack of redundancy -- or not being anti-fragile -- and lack of enough skill and experience to work over a large domain. It's pretty obvious that one person team has a single point failure: when you're away, the team is down. Such a failure mode may not tolerable to others; such a failure mode is obviously fragile, unable to absorb large shock without failing.